Click here to read ITMHCA's Statement on the treatment of families at the border. Click here for new training opportunities in 2019! Join ITMHCA and help shape professional education in Arizona, the annual Institute, and public awareness actions on this critical period of life. Network with others in Arizona, around the US and the world who want to ensure every child has the optimal environment in which to grow and succeed. Work toward your own professional Infant Mental Health Endorsement® and help others reach this professional development milestone. Endorsement® by the Infant/Toddler Mental Health Coalition of Arizona (ITMHCA) verifies that an applicant has attained a level of education as specified, participated in specialized in-service trainings, engaged in professional work related to infants and toddlers, obtained reflective supervision/ consultation from mentors or supervisors, and acquired knowledge to promote the delivery of high quality, culturally sensitive, relationship-based services to infants, toddlers, parents, other caregivers and families. In young children, mental health means healthy social and emotional development, defined as "the developing capacity of the young child to experience, regulate, and express emotions; form close and secure interpersonal relationships; and explore the environment and learn, in the context of a caregiving environment that includes family, community, and cultural expectations for young children." ITMHCA is an affiliate of the World Association for Infant Mental Health. 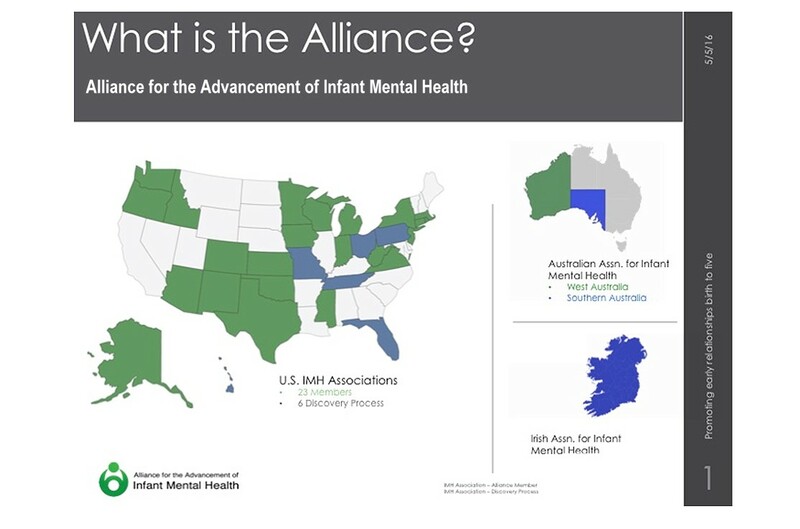 ITMHCA is a member of the Alliance for the Advancement of Infant Mental Health ITMHCA is a member of the Alliance for the Advancement of Infant Mental Health using the Michigan Association for Infant Mental Health Endorsement® system. The Alliance consists of 19 states (as of March 2015) and growing (see map). Arizona was an early adopter of the Infant Mental Health Endorsement® (IMHE®) system and met with other early adopters in September 2007 to agree to reciprocity among our states. Reciprocity means that IMHE earned in one Alliance state is recognized in another. Reciprocity also means all Alliance states must meet regularly to agree to the standards and processes involved in granting endorsement. Quarterly conference calls are held among Alliance leaders; with additional conference calls for subcommittees discussing Research, Training, Policy, and Endorsement® coordination. An Annual Retreat provides a wonderful opportunity for Alliance members from all States to meet face to face to conduct business and develop the warm relationships that facilitate the rich dialogue possible on conference calls and in emails. The Alliance communicates on a secure listserv. People from Alliance states frequently request assistance with referrals for I/T and families, for applicable research to support grants, for policy language to address incorporating IMHE into state programs and policies, and much, much more. Participation in the Alliance is advantageous to ITMHCA members! using the MIAIMH IMHE system.